The Abbott government, which is constantly beaten-up by those who want Australia to take in the world, is considering resettling persecuted Christians, but that isn’t enough for the no-borders pushers. The Abbott government is considering offering refuge to as many as 4000 Iraqis and Syrians after the new Anglican Primate of Australia, Philip Freier, called for asylum in Australia for Christians facing slaughter in northern Iraq. Dr Freier, Anglican Archbishop of Melbourne, said he had written to Prime Minister Tony Abbott and Immigration Minister Scott Morrison asking that they emulate France in offering refuge to Christians facing forced conversion to Islam or death. By the way, has anyone seen anything from the US Conference of Catholic Bishops, the Lutheran Immigration and Refugee Service or any of the other US “religious” resettlement contractors saying we should be taking CHRISTIANS into the US now? Or, are they so politically-correct and fearful of saying anything against Islam that they keep their mouths shut? 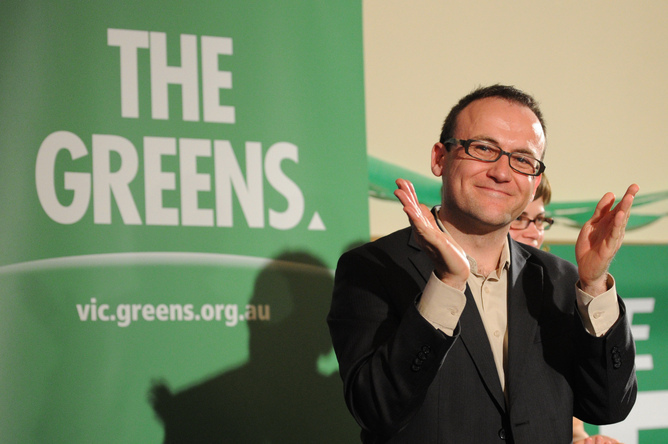 Adam Bandt wants to know why Abbott treats those in detention differently than persecuted Christians from Iraq. Could it be that those in detention have broken the law and won’t make good citizens. The text of the Sydney Morning Herald story does not include anything from the Green Party, but there is a clip of Green Party leader Adam Bandt criticizing Tony Abbott for what he calls hypocrisy because while perhaps agreeing to take 4,000 refugees now, the government is holding hundreds of Iraqis in detention. He wonders why the disparity in treatment. It is pretty obvious to me! Those in detention are mostly Muslims who broke into Australia illegally—not persecuted Christians running for their lives at the moment. Granting extra places to refugees fleeing Iraq is a good start, but it would be hypocritical of the government to send refugees already in detention back to Iraq says Adam Bandt. See all of our coverage of the migrant problem in Australia by clicking here (141 previous posts!). See especially Australia’s Muslim migrants call for Caliphate. What does Bandt not see about the difference between Muslims and Christians as prospective new Aussies? Isn’t that a novel and sensible idea! Editors note: We have a category (comments worth noting) here at RRW where we post comments from readers that you might have missed at individual posts or which came to me directly. In response to our post From Catalonia to Calais…. reader ‘momodoom’ suggests “historically proven” colonization by advanced countries would make Africa a more appealing place to live. Yes indeed! All these Africans (and Middle Easterners) fleeing their homes for the green grass of Europe! But really – who wouldn’t want to leave Africa? What does it have to make people want to stay there? Well, what could Africa do to become more appealing to people? What could the world do to make Africa more appealing…? Colonization! Historically proven to make Africa a more civilized place. The U.N. should sponsor a program to allow any Western country in to various failed Third World states. They would “conquer” the country insofar as its legal system and enforcement, and the ensuing lack of corruption and greater stability would allow for investment – both from within the country, and from interested parties throughout the world, creating improved economic circumstances which might persuade their youth to stay in-country. There would be a plethora of details to be worked out, but it would be a far better system than the one currently in place: Western countries propping up failed and corrupted states with aid money, who then produce excess population which then proceeds to leave said failed state to come and invade the Western countries. I see this as a win-win!! Can you hear the hissing now from the politically-correct one-worlders? All of our posts on the ‘Invasion of Europe’ are here. A Chinese news agency is reporting that possibly five of forty Eritreans trying to get into Western Europe through Albania show symptoms of Ebola. TIRANA, Aug. 13 (Xinhua) — Albanian police Tuesday detained some 40 illegal immigrants from Eritrea, five of whom have symptoms of the deadly Ebola haemorrhagic fever. Local media said the illegal immigrants were arrested near the city of Vlore, in south Albania. The five who have suspected symptoms were taken to a local hospital for further tests. There’s no exact statistics of refugees coming from poor and war-torn African countries to Albania. Official data shows that in the first half of 2014, about 500 Eritrean and Somali immigrants were detained in Albania. Their destination is some of the Western European countries. Albania is a country from which migrants flee, but now Africans and Middle Easterners are fleeing to the country (at least as a jumping-off place to the West). See our most recent post on the ‘invasion of Europe’ here.